That's why members of the Whale Habitat and Listening Experiment (WHaLE) team in Dalhousie's Department of Oceanography have been working tirelessly to fill the knowledge gap. In one experiment this past summer, they helped bring together a number of federal agencies in an effort to collect the most multi-faceted dataset on the North Atlantic right whales yet. "This dataset is entirely novel; we've never had so many monitoring technologies overlapping in the same time and place," says Hansen Johnson, a Ph.D. candidate working in Oceanography Professor Chris Taggart's lab. "I'm hopeful that the many facets of this dataset will provide us with new insights that lead to improved monitoring and conservation outcomes for this endangered species." The workhorse of the military system used in this study is the sonobuoy. These small, disposable buoys can be dropped from a plane into the ocean where they transmit underwater sounds back to the aircraft. Multiple sonobuoys allow pinpointing the exact location of an underwater sound source—in this case, whale calls. The Canadian Armed Forces typically use sonobuoys to detect, identify and track submarines. Sonobuoys have been used to listen for marine mammals before, but never on this scale or in combination with so many other efforts. 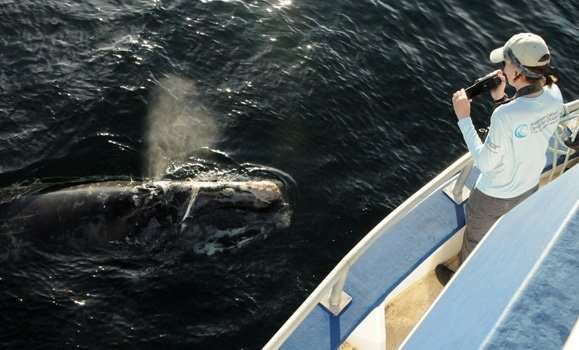 "This collaboration has united a diverse group of talented specialists, each passionate about their respective fields and united by a common goal—trying to understand and preserve these endangered whales," said Major Dugald Thomson, who is also a Ph.D. candidate in Oceanography Professor David Barclay's Noise Lab. "The government has made considerable efforts to take action on this national imperative, and this trial is just one example of inspired people coming together to use the skills and tools they have to make a difference." At the same time, scientists from the Northeast Fisheries Science Center on board a National Oceanic and Atmospheric Administration (NOAA) plane and scientists from Dalhousie, Canadian Whale Institute and New England Aquarium's Anderson Cabot Center for Ocean Life on board fishing vessel Jean-Denis Martin surveyed the area to document and photograph the right whales. 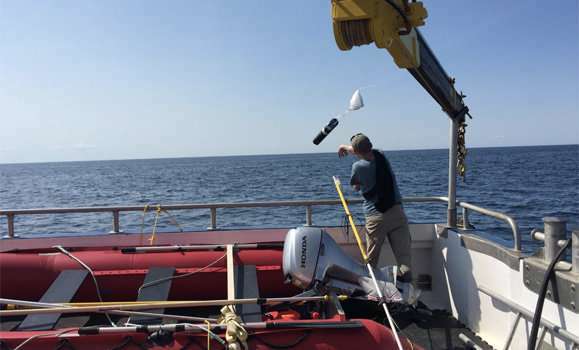 Below the surface, two autonomous underwater vehicles called Slocum gliders from Dalhousie's Ocean Tracking Network and the Marine Environmental, Observation, Prediction and Response Network recorded right whale calls and measured the ocean conditions. Above it all, DFO scientists arranged to capture satellite images to map the ocean surface. "This simply would not have happened without the support of all the survey groups, particularly the Canadian military," said Johnson. "The success of the experiment demonstrates the outstanding level of commitment to right whale conservation across agencies and borders. It's this kind of collaborative action that will give the species its best chance at recovery."